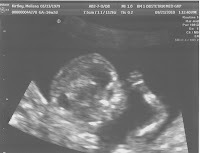 We’re at Week 19 already, and I can’t believe you’re about halfway done cooking in there. The bump you’ve made is still small, but obvious now. I feel little flutters as you move about. I wonder if that’s your arm or leg moving, or if you’re rolling from side to side, enjoying your little bit of space before it gets too crowded. Though we haven’t met face to face yet, we know each other well. It’s like we’ve been long distance pen pals for years, telling each other everything, anxiously waiting for the day we can finally meet in person. And yet we’re as physically close as two people can possibly be. I wonder what you will look like. Will you have your daddy’s trademark red hair, or will you be a little blonde toe-head? Will you be short like me, or tall like Daddy? I wonder about your personality. Will you be quiet and introverted, content to play by yourself and let your imagination run wild? Or will you be a comedian, a chatterbox, happiest when you’re the center of attention? Will you be cautious or reckless? Will you be an athlete, an artist, a brain, or will your talents be entirely different? We don’t even know if you are a boy or a girl, because for your daddy and me, the anticipation and the surprise are all part of the gift. I know these little flutters I feel will soon become full-on kicks and punches. In just a few short months, you’ll be born, and I’ll sing softly to you and rock you to sleep. You’ll say your first words and take your first steps. Time will pass quickly, and you’ll start school, and we’ll proudly display your artwork on the refrigerator. You’ll make friends, go to birthday parties and wear adorable Halloween costumes. You’ll realize that your father and I don’t have all the answers, and so you’ll discover them for yourself. You’ll become a teenager and have your first crush and your first broken heart. You’ll get a driver’s license, then graduate high school. Then we’ll help pack you off to college and come visit you on Parents’ Day. You’ll pursue your dreams and ambitions and move out on your own. Your father and I will watch, with pride and tears, the extraordinary life you’ll create for yourself. So for now, because I cannot slow down time, I am simply present with you. I savor every moment that I am able keep you warm, safe and close. I sit quietly with you, close my eyes and send you thoughts of love, my Little Baby Kirtley. I cherish every flutter and enjoy this precious time together. That was beautiful. LBK is already so lucky to be yours.